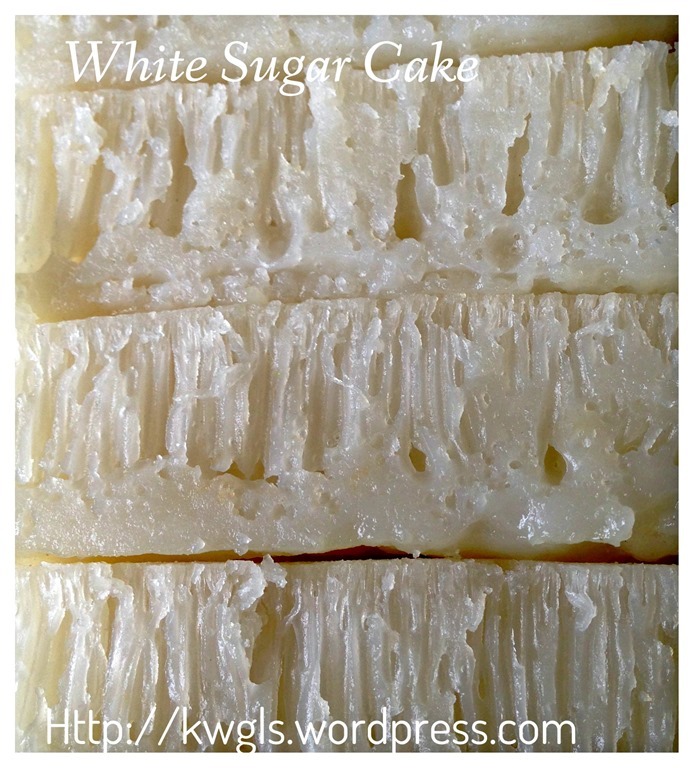 And also Indonesia’s famous Honeycomb Cake – Bingka Ambon. 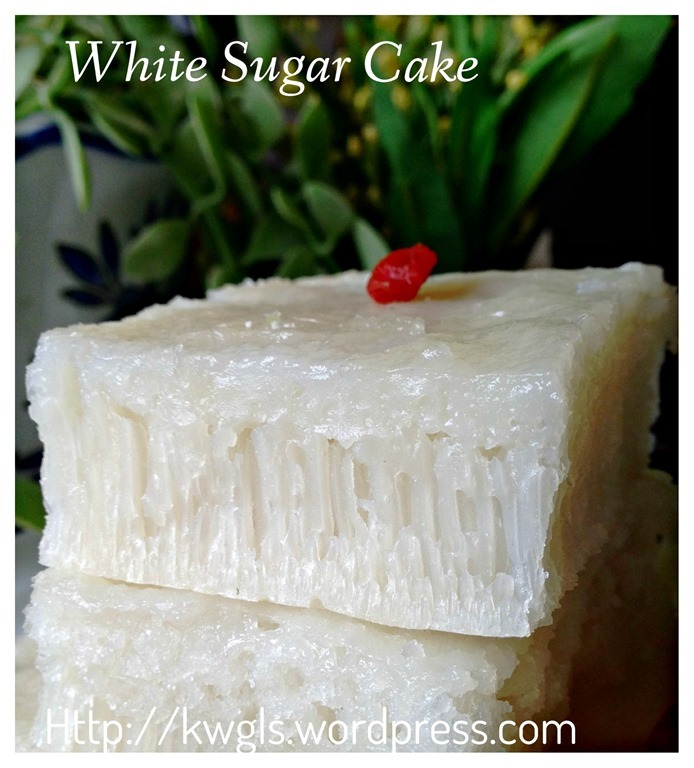 And today is the third cake in this category called Chinese Yeasted White Sugar Sponge Cake..(白糖糕）。It is a rather common breakfast item in Singapore and Malaysia. In my humble opinion, all these three cakes are interrelated though the type of flour (tapioca flour vs. plain flour vs. rice flour), method of preparation (steaming vs. oven baked vs. stove baked) and leavening agent (yeast vs. baking soda vs. baking powder) differ rather significantly but the result of the cake are all airy and spongy. There is a big possibility that they are interrelated resulted from localization of ingredients availability. 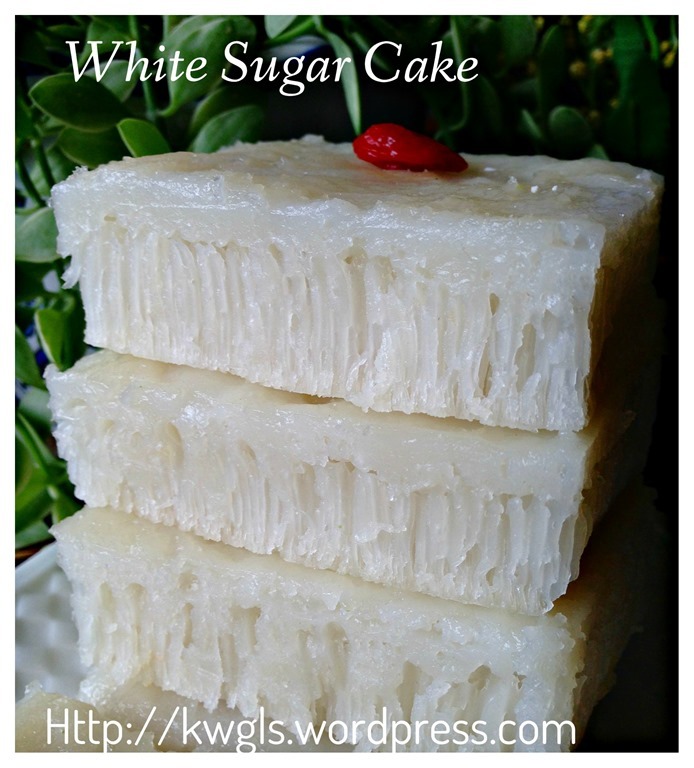 I have quite a detail comparison in this post – My Childhood Cake–Bee Hive Cake/Malaysian Honey Comb Cake or Kueh Sarang Semut (蜂巢蛋糕) and you may want to take a look to see the similarities and differences between these 3 cakes. 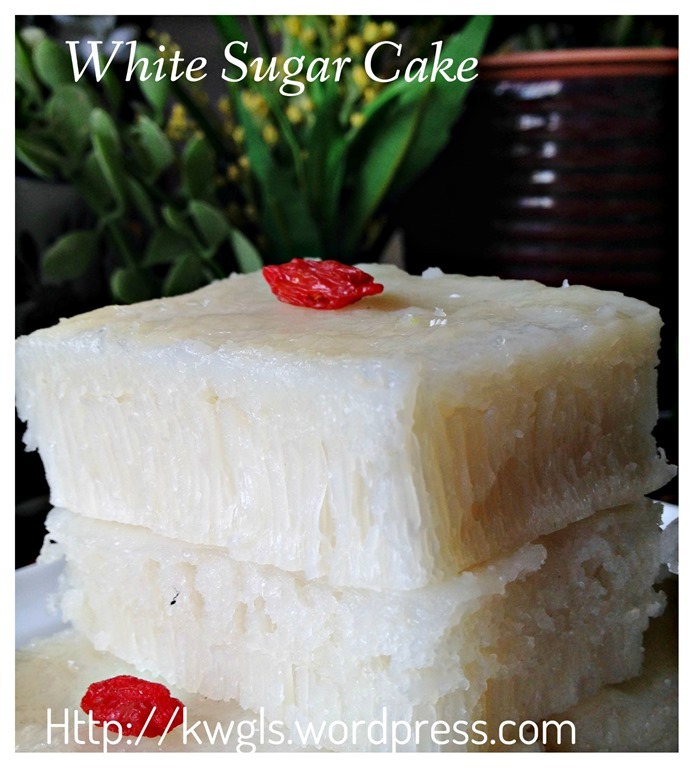 This must be one of the simplest and fastest recipes that I have came across that required only about 2 hours to get ready the steamed cake. 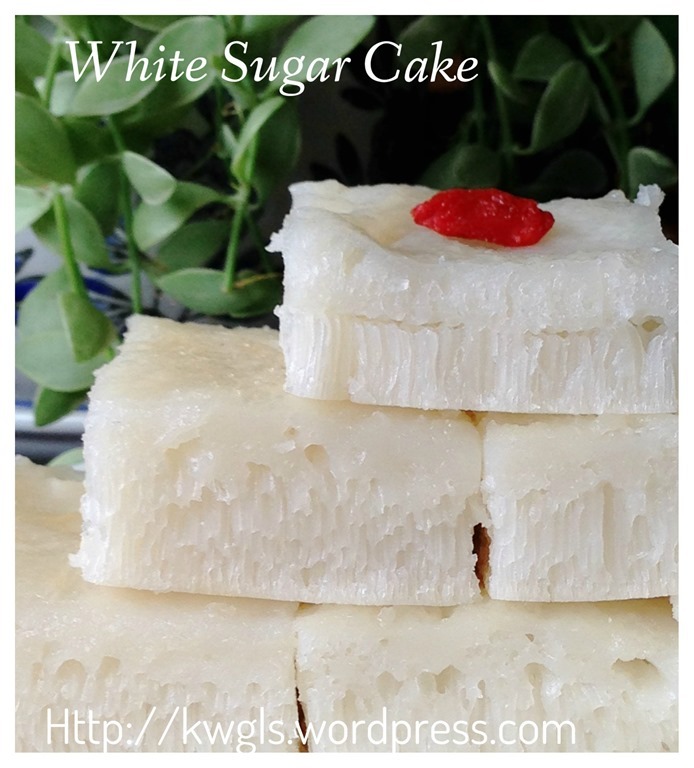 There are many recipes available and some required fermentation over days or proofing of at least 8 hours etc.… Because of its short period of preparation, I have decided to select this recipe and give it a try. The batter of the cake is very watery and that shocked me . I am very doubtful about the success of this preparation until the cake was out of the steamer. It is such a relief to see the cake is springy with airy holes. The recipe worked rather wonderfully. 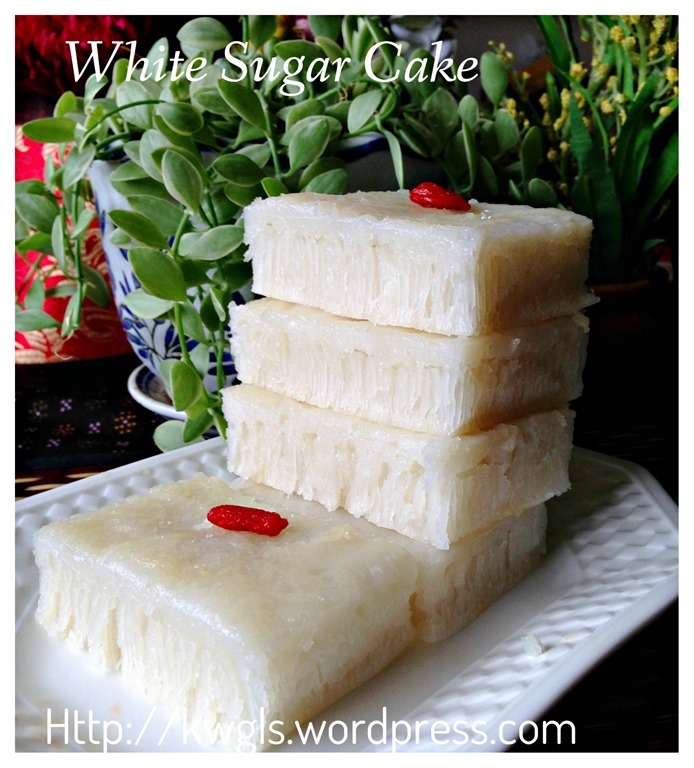 It provide a very springy cake like those sold outside. However, I am unsure why the airy holes in between the cakes are rather small as compared to the commercially sold or the picture as posted in the original recipe. I am equally puzzled. Taste wise, it is acceptable though I have hope that it have a stronger yeast flavour. Looking at the ingredients, one will know that this is a rather healthy cake for breakfast. 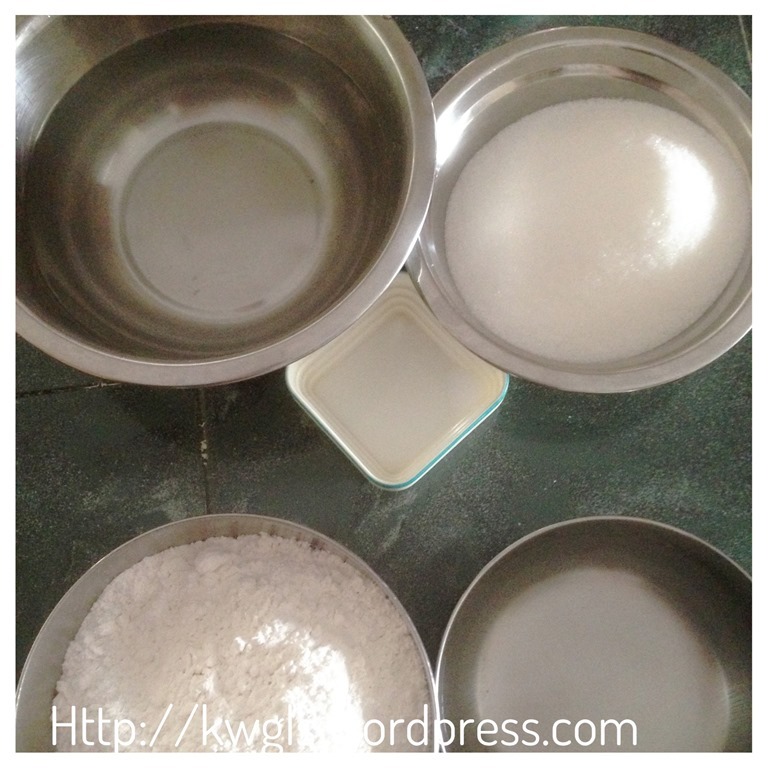 There is no oil (except greasing of baking tin) in the cake. 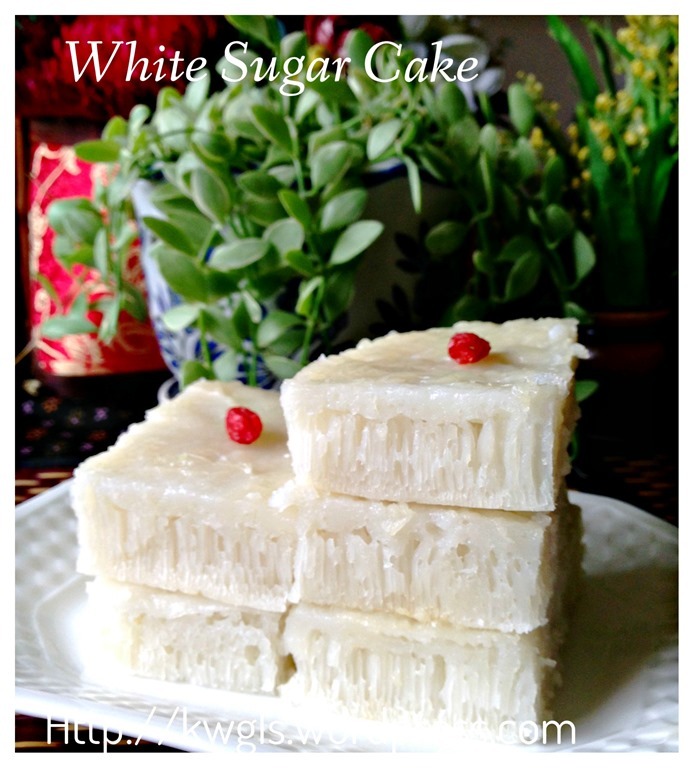 The sugar content can be adjusted downward to suit your taste buds though I do not think that the cake is sweet as compared to store bought. Grease a 9 inches diameter baking tray and get ready a steamer with adequate water capable of at least steam 30 minutes per session. 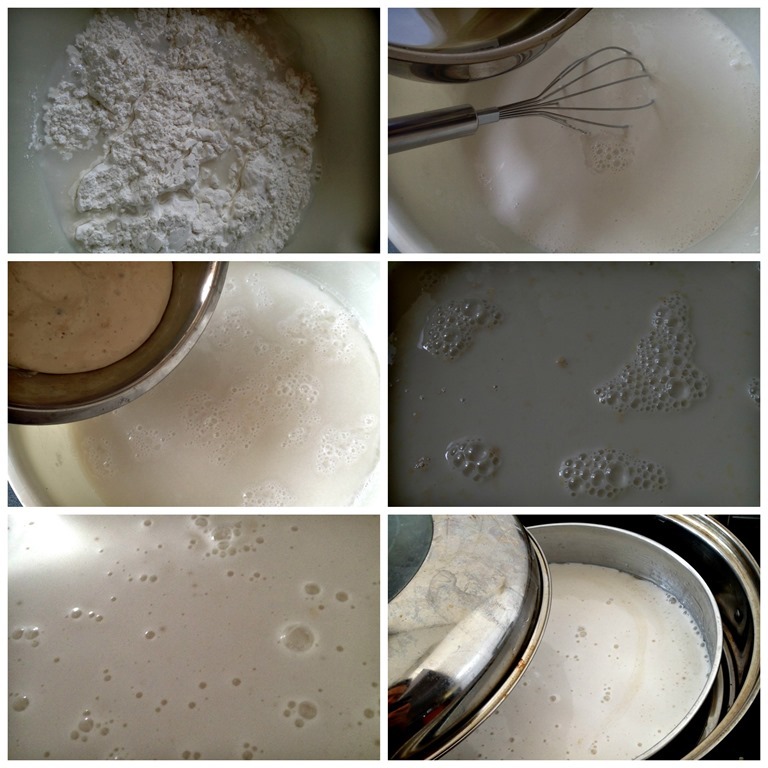 For yeast starter, in a bowl, stir instant yeast, plain flour and lukewarm water until well mixed. Set aside for 15- 20 minutes. For syrup preparation, in a pot, put sugar, water and salt. Heat over low heat until the castor sugar dissolves. 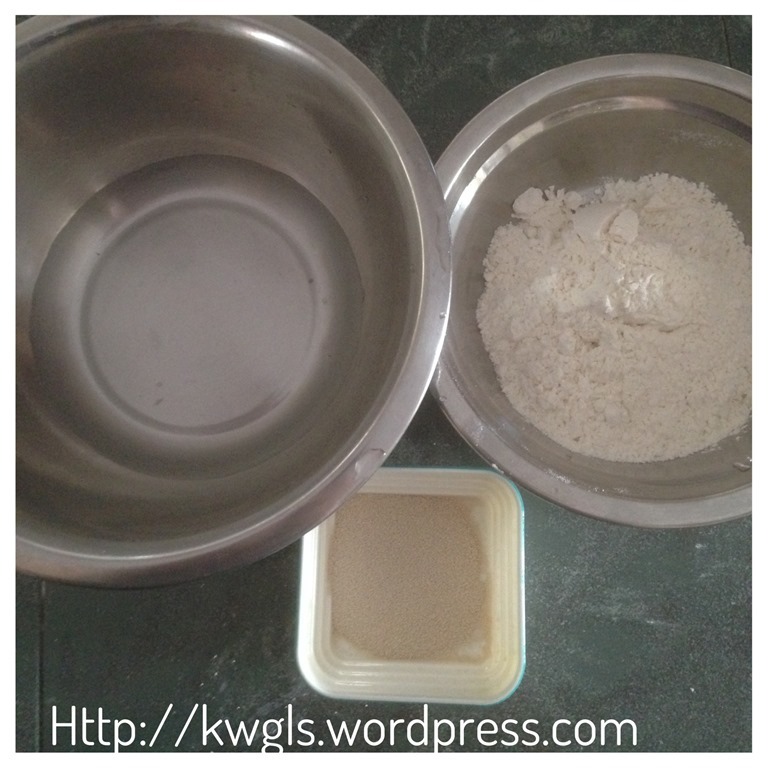 In a bowl, put the rice flour and water (the rice flour batter portion), stir until it form a thick batter. Add the syrup to the thick batter, stir until well mix and set aside and cool until it warm to touch. Add the yeast starter, stir until well mix and let it proof for at least 1.5 hours. After 1.5 hours, add the alkaline water, stir until well mixed. Transfer 1/3 of the batter to the greased baking tin and steam in the steamer at high heat for at least 25 minutes or until a skewer inserted comes out clean. 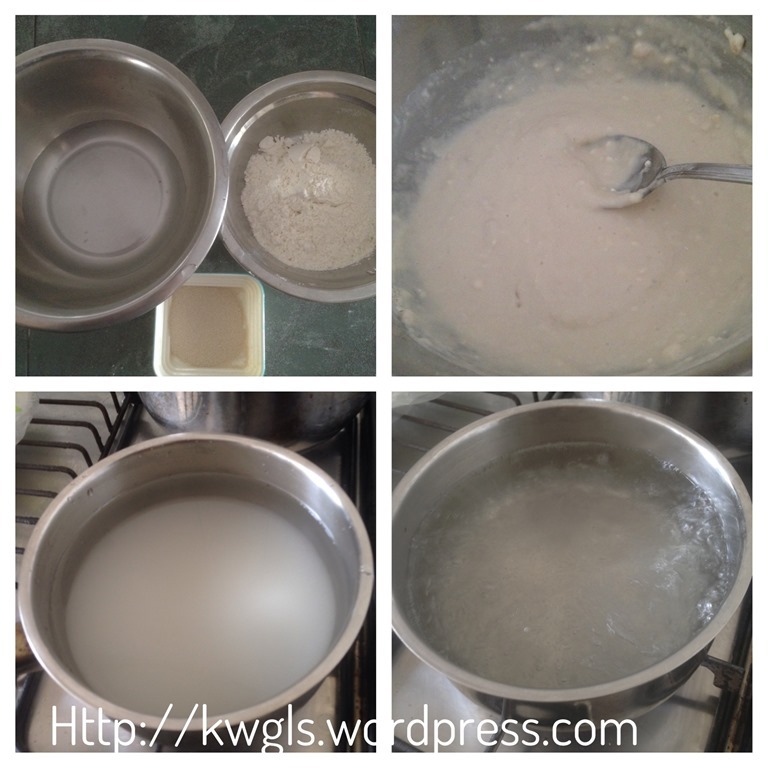 Take out the steamed cake and perform the same for the remaining 2/3 of the batter in 2 sessions. (Note that the original recipe called for single steaming and I am not confident it will work at every kitchen since it will become very thick and difficult to get cooked unless the heat of the steamer are very powerful. If you are confident, you can follow the original recipe of steaming once only). 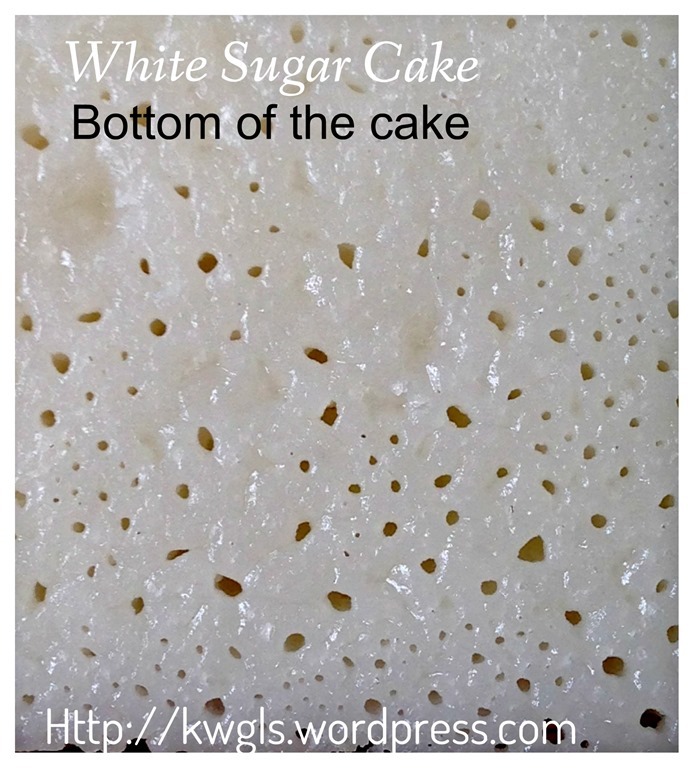 This is considered as a successful cake as it is spongy and with airy holes. The only thing that is lacking possibly is the flavour of wine yeast that were used by commercial stores. 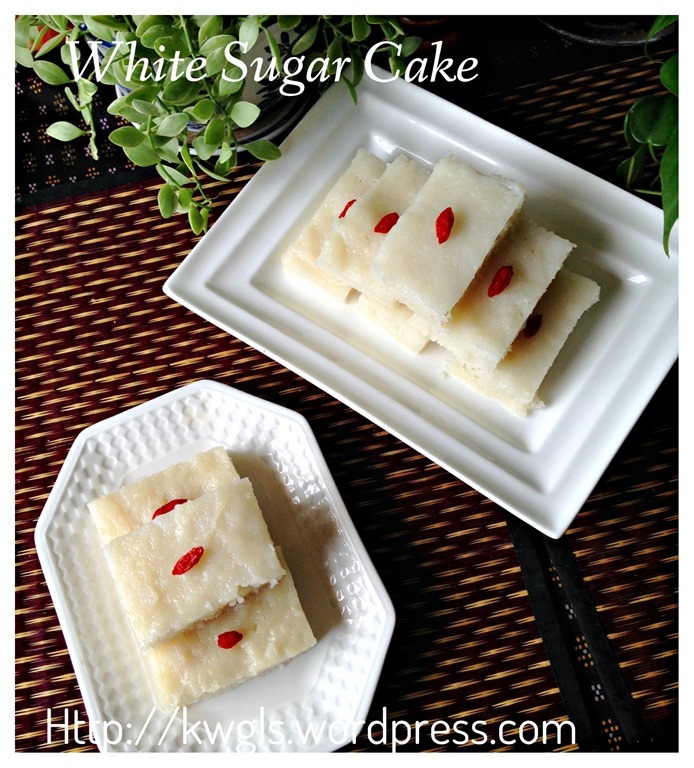 If you like the palm sugar version, you can try substituting the white castor sugar with palm sugar. 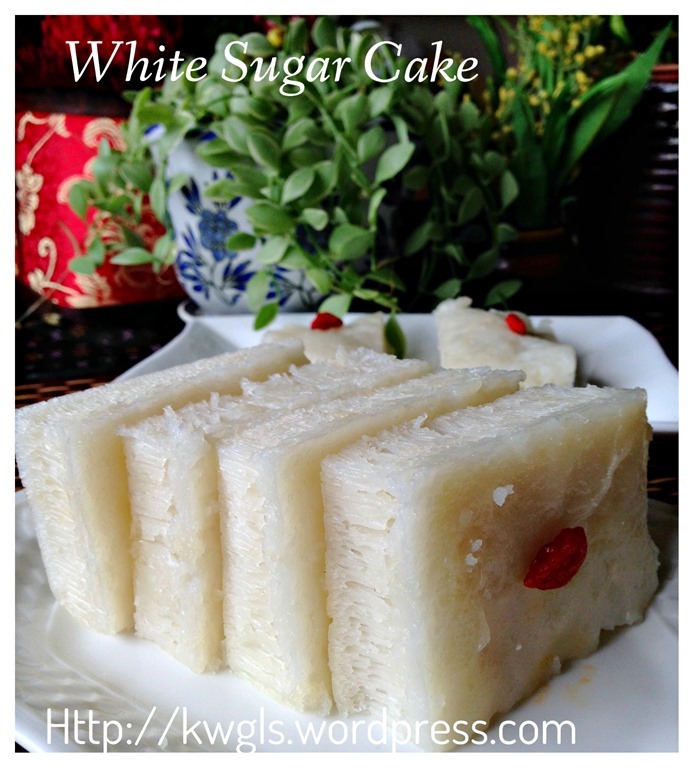 This entry was posted in Chinese and Asian Cakes and Snacks, Food Preparation Series and tagged 8, bai tang kao, 白糖糕, GUAI SHU SHU, Guaishushu, kenneth goh, pak thong ko, postaday, White sugar cake, white sugar sponge cake. Bookmark the permalink. 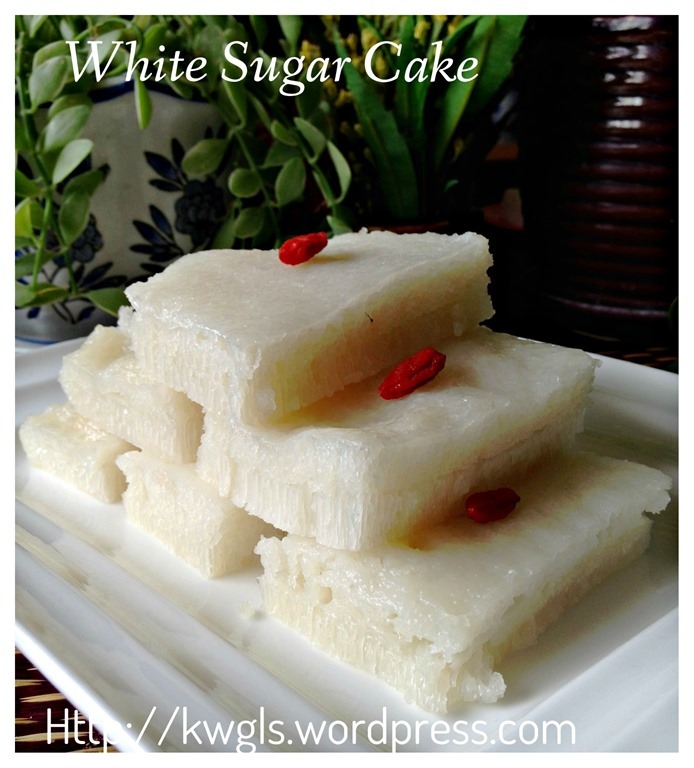 I am curious – the rice flour that you used, is it glutinous rice flour or plain rice flour? 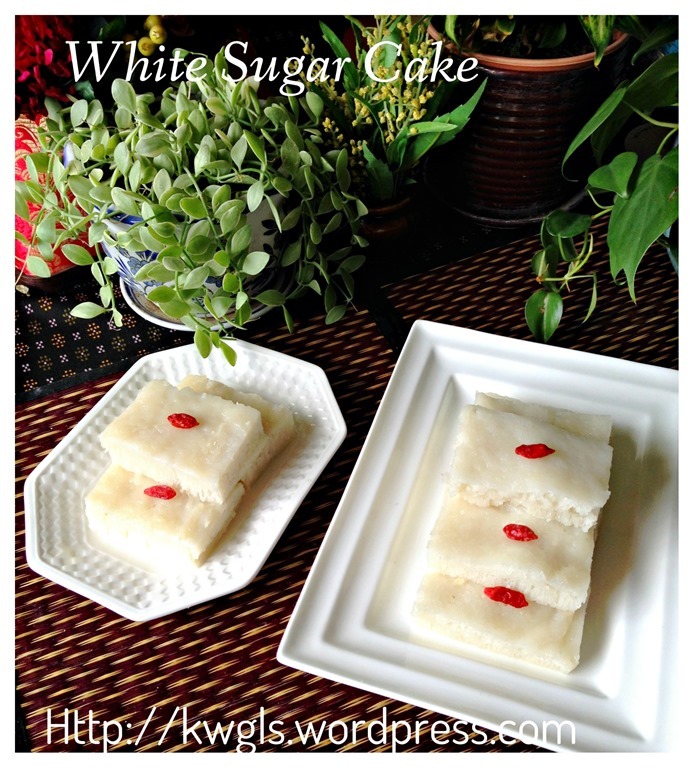 Any recipe that called for rice flour is implicit that is plain rice flour. 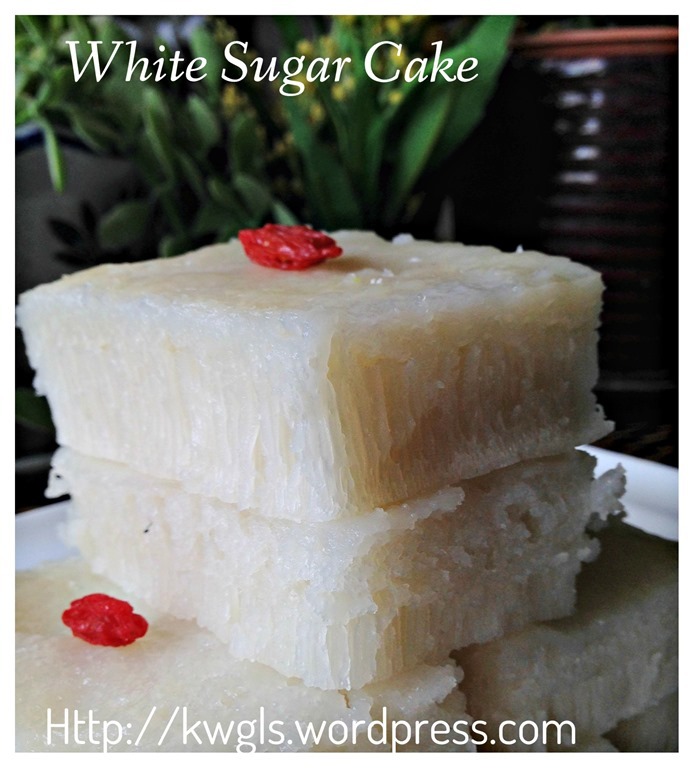 If glutinous rice flour is used, it will be mentioned in full. I am unaware that there is such a term called plain rice flour.